Much has already been made of the social media posting habits of William Daroff. Whether on Twitter or Facebook, the well-connected director of the Washington Office of The Jewish Federations of North America (and its VP for Public Policy) isn't afraid to go public with his whereabouts, upcoming speaking engagements, or even his drinking buddies. Earlier this month, the JTA's Ron Kampeas dubbed Daroff "The Fastest Tweet in the Jewish Organizational World" and the Fundermentalist (AKA Jacob Berkman) tweeted about Daroff that "the JFNA's crackberry head has a serious case of the twitters." Some in the Jewish Federation network may think that this Washington insider tweets too much, but others appreciate the bird's eye view that Daroff provides. His embrace of social media and lack of restraint when it comes to providing his daily schedule may lead to more transparency in the Jewish communal world. Keeping up with Mr. Daroff's professional life -- knowing which D.C. movers and shakers he's wining and dining, and which cities are on his travel itinerary -- is a glimpse into the life of a Federation executive that most never had. Letting the world (or at least anyone who follows the @daroff feed on Twitter) know when he's in a meeting with Israeli leaders on Capitol Hill or at the White House Hanukkah party removes much of the guessing game about the Jewish community's political access in Washington. Of course, it's easy to take the tell-all nature of Twitter too far. 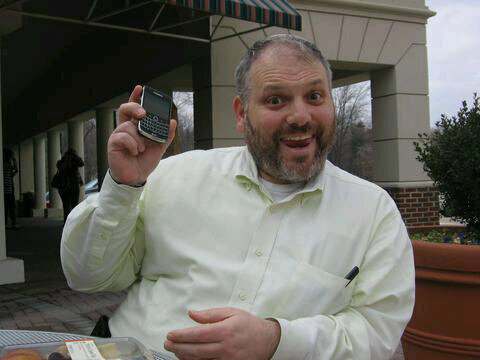 There have been times when Daroff's Blackberry tapping fingers took him into TMI territory. A friend of mine, who's a Jewish communal professional, found himself drinking Scotch with Daroff at the hotel lobby bar at this year's Jewish Council for Public Affairs (JCPA) conference. (Single Malt Scotch is certainly one of Daroff's own trending topics on his Twitter feed.) Before the first sip, the list of imbibers was tweeted around the Internet. Back at the office following the conference, a few eyebrows were raised following Daroff's tweet and my friend had to explain to his colleagues that the bar tab wasn't paid for with agency funds. Adam Kredo, writing in the Washington Jewish Week, also noted the gray area in which Daroff navigates when he Tweets his opinion. This past Fall, Daroff tweeted that the left-leaning Israel group J-Street "stands with the Mullahs and the hard left at NIAC [National Iranian Action Council]" who are "opposed to sanctioning Iran." That tweet might have gotten Daroff in some hot water, but as he aptly put it, "I have a cool job and get into cool places. You shouldn't have to buy me a scotch in order to hear what I'm up to, and Twitter allows for that." Web 2.0, in addition to opening doors into new media, has also forced us to raise questions about the dissemination of professional and personal information. Is it appropriate for Jewish communal non-profit executives to divulge what they do when the workshops and plenary sessions come to an end at professional conferences? Is it unseemly for Jewish communal executives to fire off quick missives from their Blackberry before their communication department has a chance to review them? Is it wise for leaders of Jewish organizations, rabbis, day school heads, or foundation leaders to keep us up to date in 140 characters or less? Will social media help us gain a better perspective of what our Jewish communal leaders do on an average day? My own sense is that William Daroff's "tweeps" do in fact appreciate his candor. And with over 2,500 Twitter followers and about the same number of Facebook "friends," he's built quite an audience. Perhaps if more Jewish leaders follow Daroff's lead and aren't afraid to share their activities (and ideas) with the community-at-large, there will be more young Jews eager to connect to the organized Jewish community. William Daroff is a brilliant man. I explicitly support and trust him, and his social media habits only further my respect. @Anonymous: I certainly agree. I think William is great for our nation's Jewish community. His openness on the Web demonstrates that he gets it! He's using social media to benefit the Jewish people and Israel in Washington. I hope that's message I got across with my conclusion: "Perhaps if more Jewish leaders follow Daroff's lead and aren't afraid to share their activities (and ideas) with the community-at-large, there will be more young Jews eager to connect to the organized Jewish community." It's not just about getting more young Jews eager to connect. William's communications educate many Gentiles about common concerns of Jewish Americans and all Americans. I know; I'm one of them. Any thoughts specifically for rabbis? I know this came up more than once at STAR. I think #1 is definitely to give it some thought rather than just signing up and typing away.